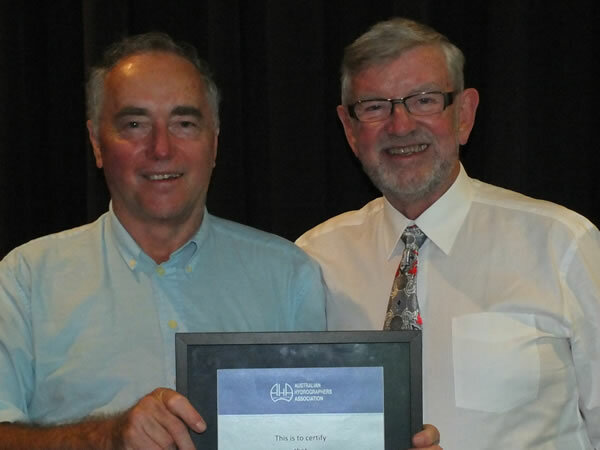 Ray Maynard was inducted as a Fellow of the Australian Hydrographers Association on Tuesday 13 November 2018. In 1975 Ray Maynard joined the Department of Natural Resources, Mines and Energy Queensland (then Irrigation and Water Supply) and a week after starting, camped out for 22 days flood gauging and was immediately hooked. He continued to work in the remote areas of far north Queensland for a few years before transferring to Bundaberg where he honed his skills in the analysis and application of hydrometric data. In 1988 he was part of a team that flood gauged the Fitzroy River, possibly at the time the largest, deepest, highest-velocity flows measured by boat and current meter in Australia. Ray has compiled a 105 page report on Burnett River Floods back to the 1850s now a key data source for multiple flood modelling projects. He spent considerable time researching ADCPs and was a member of the committee that developed the three Australian National Industry Guidelines for ADCPs. He has presented four papers at three AHA conferences between 1992 and 2016 and delivered two Papers at a Christchurch Rating Curves Workshop. In DNRME Queensland, Ray is affectionately known as Ray “Rainfall” Maynard and he is the ‘go to’ person with respect to development of rating curves, the hydraulic behaviour of rivers and theoretical computation of discharge. Congratulations Ray for your significant contribution to the profession and to the AHA and your appointment as “Fellow of the Australian Hydrographers Association”.